Ca refers to Calcium. Calcium (Ca) plays vital role in the formation and maintenance of healthy bones of proper density. Calcium is also essential in the process of cell signaling (communication between cells to coordinate cellular activities in a tissue and interaction with other tissues), blood clotting, and in the proper functioning of muscles, heart, and nerves. The Calcium Test (Total) measures the total amount of calcium in the blood. 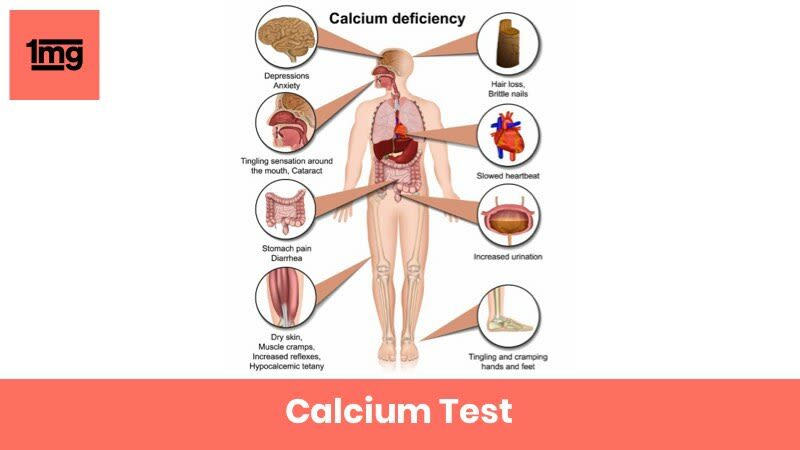 Calcium (Ca) Test measures the levels of calcium in blood. Calcium is essential for body processes including cell signaling, blood clotting, contraction of muscles, and functioning of nerves. It plays a crucial role in the formation and maintenance of healthy bones. Deficiency of calcium results in Osteoporosis, a disease in which the bones lose their density and become soft and fragile, causing them to fracture very easily. About 99% of the total amount of calcium received by the body is bound as calcium complex in bones, and the remaining 1% lies in blood circulation. Of the amount of calcium circulating in the blood, about half remains bound to albumin protein or other ions and are metabolically inactive, while the remaining half remains free and metabolically active. Blood Calcium tests can be of two types: Total Calcium Test used to measure the total calcium concentration in blood including both the free and bound forms, and Ionized Calcium Test used to measure the concentration of only the metabolically active form. Calcium levels in the blood are maintained within a very narrow range by a number of mechanisms. Deviation from the normal range of calcium concentration causes Hypocalcemia (low levels of calcium), or Hypercalcemia (excess of calcium). Both these conditions impact normal body processes in the short term and may give rise to other conditions in the long term. A blood calcium test cannot be used to check for a lack of calcium in your diet or for osteoporosis (loss of calcium from bones) as the body can have normal calcium levels even in case of dietary deficiency of Calcium. The body can augment mild calcium deficiency by releasing the calcium stored in bones. Calcium concentration in the body is maintained within a narrow normal range between 8.5mg/dL and 10.5mg/dL. Hypocalcemia or low blood calcium is indicated if calcium concentration lies below the normal range. Hypercalcemia or high blood calcium is indicated if calcium concentration lies above the normal range. Q. What are the symptoms of Hypocalcemia? Q. What are the symptoms of Hypercalcemia? Q. Is there any preparation required before the Calcium test? Inform the doctor about any medications you may be taking. Some medications like antacids, diuretics, lithium, Vitamin D supplements, etc. can affect the test results and may have to be stopped before testing. No other preparations are required unless specified by your doctor. Q. When can false results appear in the Calcium Test? False results may appear in newborns, showing hypocalcemia. This is usually due to immature parathyroid gland. False results may also appear after a large volume blood transfusion. Some medications can elevate or lower blood calcium levels. Q. What other tests can be prescribed by your doctor in case Calcium test result is not normal? Q. Which food items are good source of calcium? Q. What is Osteoporosis and how is it related to calcium deficiency? Osteoporosis is a disease where the bone density is drastically reduced, making them very weak, brittle, and easily susceptible to fracture. Symptoms do not usually appear until there is a fracture. Osteoporosis occurs mostly due to a continuous loss of calcium and insufficient dietary replacement. Calcium is required for nerve and muscle functioning, hence any shortage of it in blood is made up by supplying calcium from the bones. This loss of bone calcium causes the bones to lose bone mass and density, making them soft and brittle. New Delhi, the capital city of our country, has always been in the limelight for its historical importance, various shopping destinations, exciting nightlife or alarming pollution levels. It is the nerve center of various industries such as IT, agriculture, petrochemical or small and micro industries.With the current fast paced lifestyle, disorders like Diabetes, high blood pressure and asthma are increasing exponentially with each passing year. Therefore, it becomes important for us to go for regular health checkups to screen ourselves against these disorders. A full body checkup often entails diagnostic tests that are conducted to examine the overall condition of your body. Your doctor may prescribe tests like a blood glucose test to diagnose Diabetes, urine test to ascertain if you have a urine infection or a Electrocardiogram (ECG) to check your heart. 1mglabs is an online platform where you can get access to a host of certified diagnostic centers. You can compare prices and discounts for various health packages that are offered on the platform. In addition, you can also avail free home sample pickup offered by the lab. Remember to check the pre-test requirement so that you are well prepared for sample collection. Check out the reviews by other customers to make an informed decision before opting for a service.